Recent news from China tell us of the discovery of a massive stepped pyramid. It rose at least 230 feet high and measured 59 acres at the base. The imposing pyramid structure was situated in the heart of a long lost city that at one time encompassed an area of 988 acres, making it one of the largest in the world for its era. According to Antiquity, the journal which released the news in August 2018, the city and the pyramid were evidently a prominent center of power at the time — some 4,000 years ago. Eyes and anthropomorphic symbols adorning the pyramid have been interpreted as something that could have designated the structure’s special status in both religious and economic terms. Remnants of extensive stone walls and ramparts testify the city was capable of defending itself. What is the 535 Catastrophe theory? This article revolves around the case presented by David Keys in his book "Catastrophe: An investigation into the origins of the modern world", which suggests that the "modern age" started in 535 AD with an eruption of Krakatoa. This eruption caused widespread climate change, resulting in floods, droughts and extreme low temperatures. In the aftermath, plague spreadacross the world. These factors destabilised old regimes all over the world, creating power vacuums into which new empires arose. Keys links this to the rise of Islam, the migration of the Avar to Europe (and the displacement of other people in the process), the rise of the Turks, the decline of Britain and Teotihuacan, the reunification of China and the rise of Buddhism in Japan. "Catastrophe" is a great book, and I'm barely scratching the surface of it here. Buy a copy for every room in your house. First off, the scientific facts. That there was huge climactic upheaval around the world after 535 AD is unquestionable- it's backed up by extensive dendrochronological evidence from all round the world. It's also highly likely to have been due to a volcanic eruption, going by the significant traces of volcanic action in ice-core samples dating from that time. The question of where the eruption took place is actually fairly unimportant. After all, we all know the eruption of Tambora in the 19th century caused widespread climactic disruption around the world, but how many of us could pinpoint Tambora on a map? I couldn't. However, going by the historical records it's safe to go for East or South-East Asia, and most likely the "Ring of Fire" in the region of Indonesia. In that area, there's on infamous contender for the role- Krakatoa. Krakatoa is a real oddball, and a dangerous one at that. It blew itself to smithereens in the explosion of 1883, but a new volcanic cone (Anak Krakatau) quickly rose in its place. The pattern of eruption appears to be a rapidly-growing cone, followed by mant centuries in a dormant state caused by plugging of the vent. Then an extremely violent eruption, followed by an underwater collapse of the caldera. Put simply, it's a very, very big bang. So how could Krakatoa have caused such devastation in 535AD when the Tambora eruption of 1815 didn't? Tambora holds the official title as the largest ejection of volcanic matter into the atmosphere in recorded history- throwing out an estimated 100 cubic kilometres of matter into the air. However, it's estimated that the 535 eruption, based on observations of the caldera crater (see http://www.ees1.lanl.gov/Wohletz/Krakatau.htm for a detailed summary) threw up twice as much matter. Additionally, the undersea caldera collapse would also have thrown up a colossal amount of water vapour into the upper atmosphere, contributing to both greatly-increase cloud cover and extraordinarily heavy rainfall. Thirdly- Krakatoa explodes much more violently than Tambora (Tambora's blast was heard 2000 miles away, compared to 4000 miles away for the technically smaller Krakatoa blast of 1883), giving it the potential to hurl matter even higher into the atmosphere, causing more acute impacts on distant areas. 535 AD- Procopius writes of a year with no sunshine. 536 AD- Slavic invasions of Roman territory, sparked by Slavic poitical instability. 545 AD- Second Slavic invasion. 550 AD- Third Slavic invasion. 557 AD- the resurgent Avar reach Eastern Europe. 558 AD- Slavs, displaced by Huns (and indirectly by the Avar), invade Roman territory. 578 AD- Avar capture Sirmium. Romans now paying regular tribute to the Avar. 608 AD- Civil war spaked by Phocas. 626 AD- Constantinople surrounded by Avar, Slavs and Persians. 630 AD- recovery under Heraclius. 535- 555 AD- Dendrochronology records indicate a 20-year period of intense bad weather. 547 AD (or 549 AD)- Maelgwyn Hir dies of plague. 549 AD- Annals of Ulster record plague killing kings. 552 AD- Cynric's Saxons take Old Sarum. After a 40-year stalemate, Saxons push west. 577 AD- Battle of Dyrham. Ceawlin conquers British kingdom of Dumnonia. Saxons control England. 536 AD- Lothar (Merovingian) saved due to battle being interrupted by giant hailstones. 550 AD- Cordoba revolts against Visigoths. 555 AD- rise of Roman Spain. 535AD- "There was twice the sound of thunder"- Nan Shi chronicle. 535AD- Drought, famine "yellow dust rained down like snow" (from the Nan Shi Chronicle). 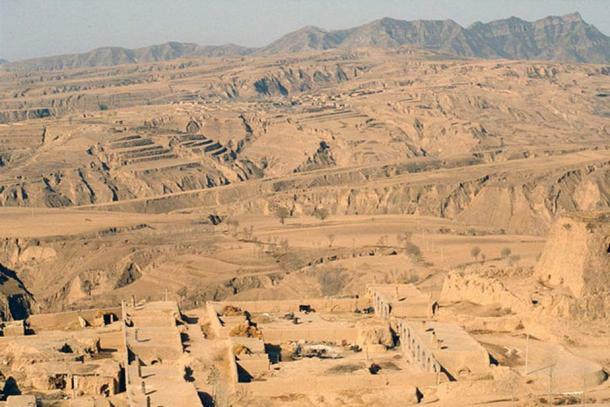 536 AD- Falls of yellow dust recorded in Sui-Shi chronicle (Southern China). Bei Shi annals report famines and cannibalism in Northern China. 537 AD- Nan Shi chronicle records Frosts and snow in August. 538- 551 AD- Tax amnesty in place due to widespread famine. Tax system collapses. 541 AD- Li Fen revolt around Hanoi area. 540's- Revolts in Northern China in the face of droughts and famine. 547 AD- Hou Jing (Northern General) defects to South, but is betrayed. Starts a major rebellion in the South. 548 AD- Hou Jing captures Southern capital Jiankang (Nanjing). Southern China begins to disintegrate. 575 AD- Northern state of Zhou attacks the South. 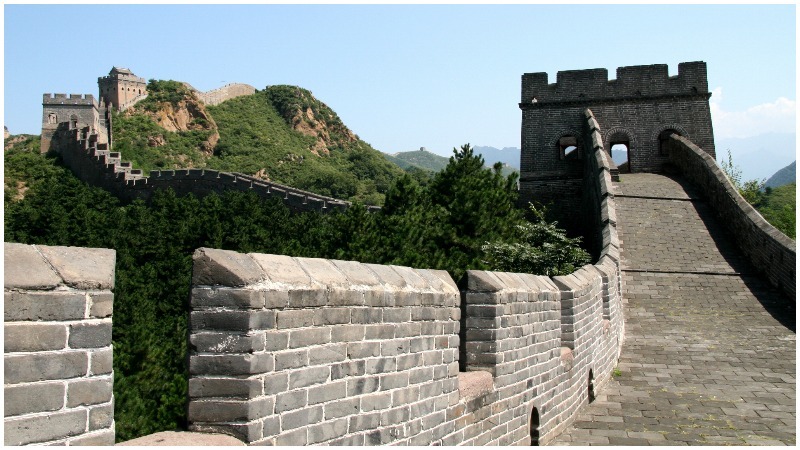 581 AD- Sui Dynasty begins in Northern China. 588 AD- North Chinese empire conquers Southern China. Re-unification of China. 535AD- The Pustaka Raja Purwa chronicle records "a mighty roar of thunder" coming from a mountain in the Sunda Straits, that separates Java from Sumatra. 552AD- Avar leave Mongolia and head West. Rise of Qarluq Turkish empire on the steppes. 985 AD- Oghuzi (Seljuk) Tuks convert to Islam. 535 AD- Kingdom of Silla converts from paganism to Buddhism. Launches on an expansionist policy. 536 AD- start of the Konwon era ("the initiated beginning"). 550- 576 AD- Silla territories triple in size. 675 AD- Korean unification under Silla. 536 AD- Nihonshoki chronicle records famine and terrible cold weather. Also plague (believed to be smallpox or measles). 538 AD- King Senka allows the Soga clan to convert to Buddhism as an experiment in the face of climactic upheaval. 540AD- Nihonshoki chronicle suggests increased immigration from Korea. Entries also suggest that Japan less troubled by famine than Korea and China. However, pestilence increases and is blamed on Buddhism. King Senka is assassinated (first royal assassination in Japanese history). 540's- King Kimmei is backed by the Soga clan. 587- Soga clan massacre the anti-Buddhist Mononobe clan. 580- Soga clan murders King Sujun. The pro-Soga Suiko is placed on the throne. Buddhists control Japan. Birth of proto-modern Japan. 535- 565AD- 30 years of drought. Skeletons recovered from Teotihuacan demonstrate signs of malnutrition and an abnormally short life expectancy. Teotihuacano civilisation declines. In South America, the Nasca culture declines too. In the aftermath of the droughts, widespread irrigation projects take place- a key factor in the later growth of the Huari and Inca empires. Dendrochronology reveals near-zero tree growth in 536 and 542-3. Tree growth does not resume normal levels until 557AD. Conjecture- increased rainfall causes surge in rodent population. Mid 6th century- abandonment of the "great Metropolis" of Rhapta in west Africa (near Lake Victoria). c. 536-540 AD- Ibn Ishaq (writing 150 years laters) records severe famine in Mecca, relieved by Amr (grandfather of Mohammed) obtaining food from as far afield as Syria. This was also reported by the 6th century poet Wahb ibn Abd Qusayy. 540 AD- Plague hits the Saba civilisation in Yemen. 540's- Plague spreads across Arabian peninsula. c. 545 AD- Marib Dam bursts after ten years of silting (18 times higher levels than the preceding century). c. 555 AD- Marib Dam burst again. Irrigation complex largely abandoned. City of Marib unable to feed its population, population levels falling by 80% in next 40 years. Saba civilisation goes into decline. Power vacuum in the area. 575 AD- Birth of Mohammed. 610AD- Beginning of Mohammed's ministry. Dominated by the Avar, with the Turks being vassals. When drought hit the steppes in the climactic upheaval, the Avar (whose economy and military power revolved around horses) were hit hard as their horses starved. Meanwhile the Turks were predominantly cattle-herders, and the miracles of the bovine digestive system allowed the Turks to carry on much as before on the poor grass. The result was that the balance of power shifted and the Turks overthrew the Avar to become the dominant power in the area. The Avar headed west into exile. As the droughts passed on their migration, the Avar's stength recovered and their horse numbers increased. By the time they hit Europe, they were a force to be reckoned with, as the Romans found out. Predictably, the Romans rode out the climactic upheaval better than most. Though their records note crop failures, their extensive trade network meant they could simply look further afield for food supplies, and they turned to Africa to trade extensively with Egypt. Egypt was also looking further afield for food- to the West African trading cities such as Rhapta. However, Rhapta is very close to the infamous "hot zone" around Lake Victoria that has given the world many horrible plagues, such as Ebola and Marburg. In 536AD, it was bubonic plague that came out of the zone into Rhapta- possibly exacerbated by a surge in the rodent population after heavy rains caused increased grain yields the following years (Africa seems to have been relatively lightly affected by climate change). Plague spreads up the trade routes to Egypt, then to Constantinople in 541AD. The Romans are significantly weakened, and in the power vacuum that followed repeated incursions by Slavs and Avar further damage the Empire. The 40 year stalemate between the Britons and Saxons is ended after plague arrives. The Britons had extensive trade links with the Roman Empire and were hit hard by plague. The Saxons had very little to do with the Romans and got off fairly lightly. Several strong British leaders die of plague, including Maelgwyn Hir (the real King Arthur, according to me). This shifts the balance of power in favour of the Saxons, and by 577AD Britain is a Saxon country. Massively abnormal silting destroys the Marib Dam and wrecks the irrigation that the Saba culture relies on. The Saba culture declines. Meanwhile, the status of Mohammed's family soars in the droughts that hit Mecca, setting the scene for Islam to rise in the power vacuum left by the fall of Saba. Terrible drought strikes the divided China. In the South, this causes severe political instability which weakens the state. The North seizes the upper hand and by 588AD the North controls China. China is re-unified. Why isn't Catastrophe theory widely accepted? Firstly, it's the theory of dilettantes, not "serious historians". A "serious historian" specialises in a certain nation or culture to a tremendous degree, but can miss the big picture when it comes to global events. Meanwhile, a dilettante who dabbles in a bit of everything takes one look at everything that happened in the 50 years after 535AD and goes "Whoa! Bloody hell!". Secondly, there's there inherent flaw with determinism- where do you stop? Why was it 535AD that caused this, and not something in 534 or earlier? Why must everything follow something else? If you go looking for magic causes, you tend to find them whether they're actually relevant or not. Nothing happens in isolation. In most cases, none of the affected civilisations fell as an unquestionable 100% entire result of the eruption. Instead they were weakened and declined, creating power vacuums in which new empires rose. It requires looking at a complex series of interactions, and all I can see is that wherever you look you tend to see Krakatoa's fingerprints. While it may not have been the sole cause, it certainly was a cause- and a cause all over the world. Thirdly, to really buy into 535 Catastrophe theory requires looking at a mix of disciplines- namely history, vulcanology and epidemiology (coincidentally, I was already interested in all three- which may explain why I'm such a sucker for the theory). This is particularly true when looking at the effects on Northern Europe, where one is required to accept that the Justinian Plague was an indirect result of the eruption. That's the biggest leap of faith in the theory. If you study epidemiology, you became familiar with "Hot Zone" theory. Viruses tend to lurk quietly in isolated little areas of the world such as Lake Victoria in Africa (a notorious Hot Zone, linked with Ebola, Marburg and AIDS). In hot, humid conditions where animals and humans are in close proximity, the virus can jump species. Then the establishment of new/improved transport links to the area spreads the plague, just as the construction of the Kinshasa Highway brough AIDS out of the jungle. With the Romans facing disastrous crop failures in Europe and turning to trade links further south, a plague gateway is established. There are two suggested factors that would link the eruption with the plague. Firstly, the increased trade movements to far-afield regions. We know the Romans had trade links to Western Africa- it's where their ivory came from. Increased trade movement would increase the chances of contagions spreading, and with the Romans looking further afield for food supplies this is a possibility. The second epidemiological case comes from situations where animals and humans come into closer contact. I have not been able to locate dendrochronological evidence regarding the climate in West Africa at the time, though there are a number of posibilities. David Keys suggests that in the face of increased rainfall in 535AD, followed by relatively mild after-effects (as with the Japanese example) there could have been bumper cereal crops in the following years. This would have produced a very rapid rise in the rodent population, which often causes migrating swarms of rodents looking for new food sources- and rodents are the principle carriers of plague. Alternatively, if the weather was severe in West Africa it could have caused humans to migrate looking for food, bringing them into plague zones. Upheaval causes plague to spread, so whichever way the weather went there could be links to the eruption. There's no denying that the climactic upheaval affected culture all over the globe. Some seem to have got off fairly lightly, such as Japan and Africa. However others were hit very hard, such as Teotihuacan and the Avar. The real hinging point for the theory is whether you buy into the notion that the Justinian Plague of 541AD was caused by the 535 eruption. Having studied "Hot Zone" theories of epidemiology, I find it a very plausible explanation- though I can understand others having reservations. If you accept the plague as a result of the eruption, you get the fall of Britain, French dynastic implications and a huge impact on the Roman Empire too. So that's the theory. Even if you don't buy the Justinian Plague angle, if you take a look at the world's history in the century after 535 AD, you have to admit it was one hell of a time. Chris Dunn: Mysteries of the Pyramid Builders—Revealed! The Ancient Kentucke Historical Association is proud to present Christopher Dunn, an authority on the technologies of ancient Egypt, talking about Egypt and her mysterious pyramids. The title of Dunn's program is: "Mysteries of the Pyramid Builders—Revealed!" •	How were the pyramids built? •	What mysteries are housed within the new chamber discovered high in the Great Pyramid? •	Were the pyramids built using Mega Machines? You can find out and decide for yourself by attending a presentation sponsored by the Ancient Kentucke Historical Association on Sunday, Feb 18, 2018 by Christopher Dunn, author of best-selling books, The Giza Power Plant, and Lost Technologies of Ancient Egypt. Chris’s research reveals new evidence that will give you a new and challenging perspective on how pyramids and temples were built. He will be assisted by Dr. Arlan Andrews of Crestwood, KY, who traveled with him to Egypt in 2008, and who wrote a Foreword to his second book. Mr. Dunn will give his presentation at 2:30 PM, Sunday, February 18 2018, at the Eastwood Fire Department station, 16010 Shelbyville Road, Louisville, Kentucky 40245. The public is invited and admission is free. Mr. Dunn will be available afterwards to sign copies of his books. Christopher Dunn was born in 1946 in Manchester, England, and has an extensive background as a craftsman, starting his career as an indentured apprentice in his hometown of Manchester. Recruited by an American aerospace company, he immigrated to the United States in 1969. For 48 years, Chris worked at every level of high-tech manufacturing from machinist, toolmaker, programmer and operator of high-power industrial lasers, Project Engineer and Laser Operations Manager. For 17 year, he served as Human Resource Director for a Midwest aerospace manufacturer. Chris's pyramid odyssey began in 1977 after he read Peter Tompkins' book Secrets of the Great Pyramid. His immediate reaction after learning of the Great Pyramid's precision and design characteristics was to consider that this edifice may have had an original purpose that differed from conventional opinion. After further research and study of source material on various theories, Chris concluded that it must have originally been built to provide a highly technical society with energy—in short, it was a very large machine. Discovering the purpose of this machine and documenting his case took the better part of twenty years of research and resulted in the 1998 publication of Chris’s book, The Giza Power Plant: Technologies of Ancient Egypt, which describes a holistic energy device that is harmonically coupled with the Earth and its inhabitants. Chris has published over a dozen magazine articles, including the much quoted "Advanced Machining in Ancient Egypt" in Analog, August 1984, and has had his research referenced in over a dozen books on Egypt. In the United States he has appeared on PAX Television, the History Channel’s “Ancient Aliens”, Travel Channel, Discovery Channel, The Learning Channel, and Lifetime Television discussing his research. He has made presentations on his findings at conferences worldwide.